THERE WAS AN 11% rise in reports of racist abuse to the Immigrant Council last year, compared to 2014. There were 240 racist incidents reported in total in 2015, up from 217 the year previously. Of these, 37 reports involved physical violence, 99 instances involved verbal harassment, 68 were incidents of discrimination, and 31 were of physical violence and intimidation. There were also 13 incidents of written harassment. A fifth of all racism reported was on public transport, while almost a third occurred while the victim was at work. There were 23 incidents of racism reported that took place in an educational institution, and 19 incidents that occurred on the street. Some 13% of all reports involved physical violence. Four out of 10 victims identified were from the Muslim community, while a third identified themselves as African. Other victims identified themselves as immigrants (23 incidents), central and eastern European (19 incidents), from the Indian subcontinent (3%) or white European (five incidents). The statistics come as the Immigrant Council of Ireland, National Transport Authority and nationwide public transport providers launch a #StopRacism campaign encouraging people to report racism when they witness it. There were 49 reported incidents of racism on public transport last year, mostly relating to passengers abusing staff. “Elements of physical violence were also quite often reported,” a spokeswoman for the Immigrant Council of Ireland told TheJournal.ie. Victims were mostly spat at or they had objects thrown at them, while some victims reported being punched or kicked. The spokeswoman added that two incidents of racist abuse involving the victims suffering mistreatment from the staff of transport providers, and said passengers have also reported being victimised by fellow passengers. 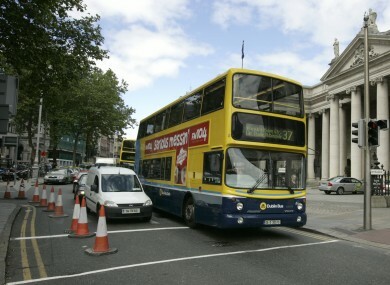 Dublin Bus is the largest public transport provider in the country, and has an increasingly multi-ethnic workforce. Over one in every six employees at the transport provider are from outside Ireland – 16% of the total workforce, from 68 different countries of origin. “Dublin Bus does receive complaints periodically regarding incidents of racism from employees and customers and actively encourages such incidents to be reported,” a spokeswoman told TheJournal.ie. We monitor complaints so that we can give particular attention to incidents that have a racist element. She said Dublin Bus takes such incidents very seriously, and has an “equality, diversity and non-discrimination” strategy, to ensure full equality and inclusion for employees and customers from minority groups. The Immigrant Council also detailed another incident of a young female of African descent who was subjected to racist abuse by a couple in their 20s, who were asked to leave a bus by the driver. “The driver intervened, and asked the couple to stop the abuse or leave the bus,” a spokeswoman said. The couple initially stopped their behaviour but then the male opened a banana, he rubbed it in his victim’s hair, and ran away with his female friend laughing and again racially abusing the victim. The Immigrant Council also said that taxi drivers of African origin report being passed by four or five passengers in a taxi rank. They also reported a high level of damage to their vehicles. To report a racist incident, click here. Email “Drivers 'spat at, punched and kicked' in racist incidents on public transport ”. Feedback on “Drivers 'spat at, punched and kicked' in racist incidents on public transport ”.